April 18, 2018 April 17, 2018 / J.K. This book will be released next Tuesday (April 24). I was excited to be contacted by a new publisher (or publisher’s agent) to request a review. Obviously, that means I received a free copy of this book in exchange for an honest review. Level – Quick, easy book. Reads much shorter than the roughly 275 pages. If you are looking at it, I’m sure you’ve figured out it is a pregnancy book. It is definitely more ‘handbook’ than most other pregnancy handbooks and guides out there. The book is broken into four parts – the three trimesters and what he calls the ‘fourth trimester’. Within each part is a chapter for each month, and each month is broken into weekly subsections. Each part has an intro to the trimester and a summary checklist for things to have accomplished for the trimester at the end of the part. Chapters (months) likewise have a shorter intro with a stats page with things like size comparisons and ‘new gear’, which is things the baby will develop that month (lungs, toes, etc.). The write-up for the week is about a page and has a separate text box with info such as baby stats, mom stats, and not-to-miss appointments. The remainder of each sub-chapter is ‘family goals’, which include things like ‘plan ahead’, ‘budget savvy’, and ‘home CEO’. In the intro to the book, Kulp explains each of the 13 family goals that come up. However, each week only has two to four. The ‘fourth trimester’ is a section devoted to the first three months of the baby’s life. He follows the same format as the other trimesters, which leads to funny comparisons as fruit no longer does the job (for 2 month old, he reference a house cat or Thanksgiving turkey). As mentioned above, the is the most handbook style pregnancy book I’ve read. I’d recommend buying the book as soon as you are pregnant and reading through the whole thing. Then, as each week comes up, flip back through and review the stats pages and text box, as well as family goals sections. The trimester checklist at the back of each part is incredibly useful, though it really should be in the front. As you enter each trimester, skip to that end and make yourself aware of the checklist and things you need to accomplish. Kulp’s writing style is funny and quick, I had never heard of him before, but apparently he is big in the dad blogosphere. The book is a useful guide, the strength is probably the family goals. I didn’t like the names of two of them, because I don’t like the word ‘doula’ and I really dislike ‘daddy daycare’, because the implication being that a dad is not a caregiver. I would just call this parenting. However, the phrase was likely chosen for the alliteration, as Kulp is a stay at home dad with four children, I doubt he sees himself as being stuck on ‘daycare duty’, as I’ve heard to referred to before. The ‘fourth trimester’ section is a novel concept, most books take you to a few weeks, maybe a month, after birth, if they don’t stop with birth itself. Similarly, the sub-chapters for weeks 41 and 42 are pretty funny, especially if you’ve had a child (or no of one) that stayed too long and the overwhelming feeling of the mom who just wanted to get the baby out of her. I like that he mentions the heartbreak and struggle of miscarriage, telling his personal story; this is a topic often skipped in most pregnancy books (and really life in general, as I found out when we went through one). I also appreciated his focus on keeping an eye on your wife after the birth for signs of post-partum depression that can be much more serious than the typical ‘baby-blues’. When I found out we were pregnant, I think I bought six books. I’ve since read and reviewed another four or five, and probably have to put this as the top two or three. Overall, it is a good book, and well written, and I particularly like the guide style, which makes the book very practical with useful tips. There is nothing in there about pre-pregnancy or trying to conceive, so if that is your focus, look elsewhere. 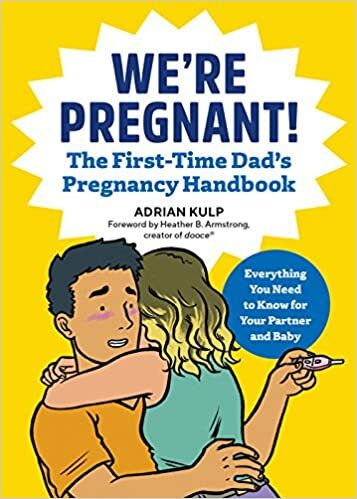 He has geared the book to those dads who just found out there are pregnant. So, if that is you, put this on your list.